So you’ve probably heard all about the mortgage rate resets that will occur over the next decade, but now you can see them in colorful graph form! The graph above, based on Credit Suisse data and recently published by the International Monetary Fund includes everything from negative amortization loans to Alt-A loans to agency-backed loans and prime paper home loans. It details several types of adjustable-rate mortgages that are due to reset over the next ten years, whether it’s shedding their interest-only option or their ultra-low start rate. 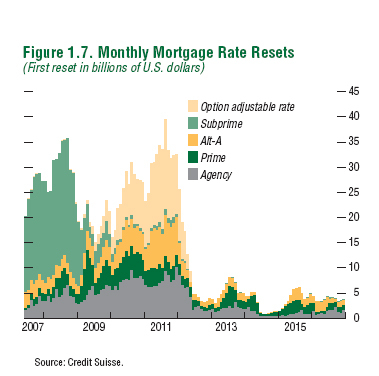 To give you an idea of how bad it could be, adjustable-rate mortgages worth a record $50 billion are scheduled to reset to higher payments this month alone, while roughly 1.3 million subprime ARMs are due to reset between now and the end of 2008. What’s more frightening is that a recent poll indicated that most borrowers didn’t even realize their mortgages could/would reset, or what exactly it all meant. Unfortunately, for many borrowers stuck in option-arms and other high-risk adjustable loans, once their interest rates do reset, and monthly mortgage payments rise substantially, many will have little or no equity to bail themselves out. 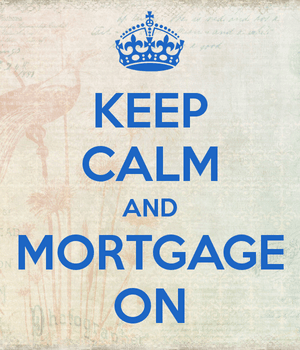 This will make it very difficult to sell the property or refinance the underlying mortgage. As you can see from the chart above, the option arm is clearly the biggest problem, which makes sense since it was also the most popular high-risk home loan program available during the run-up. Funnily enough, commissions were also the highest on that loan program, go figure. Interestingly, many loans deemed prime (A-paper) during loan origination and subsequent dumping on the secondary market will in fact be identified as subprime loans once interest rates reset, as many borrowers who got into the loans did so because the teaser rate was the only affordable payment. And Alt-A is a very broad and vague category that was slapped on just about every home loan originated over the past five years to make it seem a little more harmless. In most cases, it meant stated income underwriting, a low or zero down payment, and perhaps even a low credit score to boot. Taken together, the layered risk is arguably bad enough to make many of these loans subprime. What it all means is that the mortgage crisis is in its infancy, and the consequences of years of loose lending and appreciating home prices will likely be matched with an equal amount of misery. Buckle up for a long ride back to the bottom folks. It’s not going to be pretty, but it probably won’t be as bad as it looks either. Expect a government refinancing program to bail out lots of homeowners, short sales to minimize foreclosures, and perhaps some homeowners stepping up regardless of higher payments. Related: How mortgage rates are determined.